The "Moskva" Hotel has convenient traffic routes and is located close to the Simferopol international airport, central railway station, and central bus station. The Hotel provides 190 comfortable rooms of various categories for accommodation - Economy, Standard, Business, Junior Suite, and Suite. A Standard room includes - air conditioning, TV, fridge, telephone, Wi-Fi Internet access, desk, hair-dryer, and set of toiletries. The "Moskva" restaurant seats 250 people at a time and serves a wide range of traditional Russian and European courses, rich cocktail list, and wine list. Buffet tables and banquettes can also be arranged here. 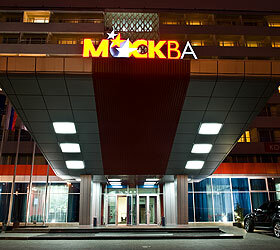 The Moskva hotel is suited for meetings and events of all kinds with up to 250 participants. The hotel has three halls, able to accommodate 30 to 250 people and fitted with state-of-the-art multimedia and sound equipment. Coffee breaks, buffets and business lunches can be arranged for participants. The parking lot is ample enough for a large number of cars. The "Moskva" hotel provides a wide range of additional services and facilities, including: round-the-clock reception, lobby bar, round-the-clock cafe, car rent, storage room, mini safe box, laundry, beauty salon, business centre, ambulance call, first-aid kit, guide/translator, tickets booking and delivery, guided tours, and photo shoots in the hotel and restaurant.